Saturday’s BUBBA Burger Sports Car Grand Prix at Long Beach was a rough and tumble affair. 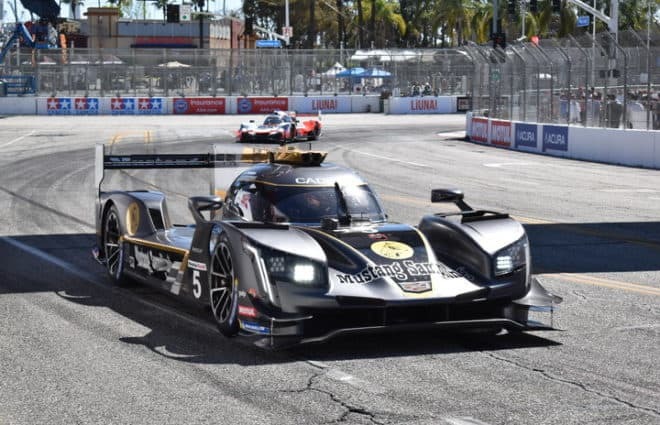 Action Express Racing’s Joao Barbosa and Filipe Albuquerque were able to avoid the issues and hold off a late Acura Team Penske to win at Long Beach for the second year in a row. Helio Castroneves led from the pole early, but it did not take long before trouble broke out. On the first lap, CORE autosport’s Jon Bennett turned in for Turn 6 too early and clipped the inside wall. That shot him into the tires. Bennett tried to resume and couldn’t do so due to broken steering. Before the caution came out, Wayne Taylor Racing’s Jordan Taylor and Mazda Team Joest’s Jonathan Bomarito had contact in Turn 8, resulting in Bomarito spinning and tapping the wall. The yellow came out at that point. Bennett was done for the day, while Bomarito lost a couple of laps getting repairs. Jordan Taylor continued in the race, but was penalized. That penalty was not for anything having to do with the Bomarito incident, but for passing Juan Pablo Montoya under the local yellow for Bennett’s crash. That penalty took the No. 10 Cadillac out of the hunt. Later, teammate Renger van der Zande hit the wall exiting Turn 9 and heavily damaged the Cadillac, ending their day. Castroneves led without too much trouble until he apparently hit the pit lane speed limiter exiting the Hairpin. This allowed Felipe Nasr to take the lead while Castroneves dropped to third behind Tristan Nunez. Trouble continued for Mazda Team Joest’s No. 55 when Harry Tincknell stalled on-course to bring out the second and final caution with 65 minutes to go. Everyone pitted for what was going to be their one and only stop. Pipo Derani was able to get out of the pits first, but had an issue with the right front wheel nut. Sure enough, the nut came off a couple of turns after leaving the pits. The wheel followed off the car in Turn 4, forcing Derani to make an emergency pit stop. During that emergency pit stop, the Action Express Racing No. 31 crew made the mistake of topping off the fuel cell, which is a violation of IMSA rules. A stop and 10 second penalty was given shortly after the restart as a result. Derani and Nasr would eventually finish sixth, 35 seconds back. Juncos Racing attempted an alternate strategy by keeping Kyle Kaiser out to lead. 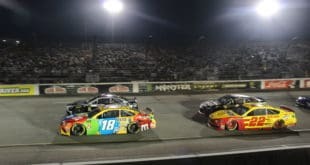 The strategy worked well as Kaiser was able to hold the lead for 14 laps before finally pitting with 45 minutes to go. That gave the advantage over to Oliver Jarvis in the No. 77 Mazda. The pit stops under the final yellow resulted in a final run that was too long for most of the leaders to make. As a result, everyone made a second stop with between 30-35 minutes to go. On that stop, Albuquerque got a faster stop due to changing only a right front tire that had a slow leak. As a result, Albuquerque was able to jump Jarvis and take the lead with the Acura ARX-05s hot on his tail. Ricky Taylor in the No. 7 Acura, who had fresh rear tires, was able to run down Albuquerque in the closing laps. A fierce battle developed, but Ricky was never able to get himself fully alongside. Ultimately, lapped traffic gave Albuquerque just enough of a gap to hold on for the win. Ricky Taylor and Castroneves finished three-quarters of a second out of the lead in second. The No. 6 of Montoya and Dane Cameron finished third, followed by Jarvis and Nunez. JDC-Miller MotorSports’ No. 84 Cadillac for Stephen Simpson and Simon Trummer were fifth. The GT Le Mans class was quite rough on Saturday. Nick Tandy led early from the pole, but teammate Laurens Vanthoor had to deal with the rest of the class. In the opening laps, the No. 4 Corvette of Oliver Gavin ran in the back of the No. 912 Porsche, damaging the rear diffuser. Earl Bamber noted after the race that the damage hurt the rear downforce, forcing the Porsche GT Team to make tire pressure adjustments in order to compensate. The key moment of the race was the second yellow. Right before the caution, Sebastien Bourdais brought the No. 66 Ford GT in for four tires and a switch to Dirk Müller. With the rest of the pack pitting, that put the No. 66 in the lead and able to pull away from a snarling pack behind. Bamber was able to get past teammate Patrick Pilet a couple laps after the restart and proceeded to run down Müller for the class lead. In what was a bit of a trend on Saturday, Müller apparently hit the pit lane speed limiter exiting the Hairpin, which allowed Bamber to take the lead. From there, Bamber was able to deal with the broken rear diffuser and the exhaust loosening late to claim the victory. Behind Bamber, a fierce battle sparked up in the closing laps between Müller and Corvette Racing’s Jan Magnussen. Magnussen was all over the No. 66, trying to get the position while avoiding blocks. On the final lap, the No. 66 simply did not go exiting Turn 8. That left Magnussen with nowhere to go but directly into the Ford. All indications are that Müller ran out of fuel. When Magnussen ran in the back of the Ford, he busted the radiator on his Corvette. Despite that, he was able to nurse it to a second-place finish for himself and Antonio Garcia, four seconds back. Gavin and Tommy Milner were third, while the No. 66 Ford ended up classified fourth, a lap down. Pilet and Tandy ended up fifth. The IMSA WeatherTech SportsCar Championship teams will take the next two weeks off before returning to action at Mid-Ohio Sports Car Course on May 4. All four classes will be in action with the addition caveat that it is the debut for the WeatherTech Sprint Cup, a championship-within-a-championship for the GT Daytona class. A field of nearly 40 is expected for 160 minutes of racing.